Located in Algonquin Provincial Park, Algonquin Art Centre is a must-see place for all the art lovers. Algonquin Art Centre displays a fine collection of world-class art most of which depict the wilderness of Canadian landscapes. This art center is open from June through October and also organizes an annual exhibit to establish the connection between nature and art. A nice place to stop gor an hour or so. Lots of great art work by various artists at resonable prices. A friendly staff clean restrooms and a small cafe for a quick bite. Regardless of whether it’s cold, rainy, or sunny outside, you’ll want to soak up Algonquin Park from the lens of some of Canada’s most talented artists by making a quick 45 minutes visit to the Algonquin Park Art Centre. Starting with artists such as the Group of Seven (a group of some of Canada’s most renown artists who are especially known for their ability to depict the beauty of Canadian nature in their paintings), art has always played an instrumental role in becoming the popular park that it is today. 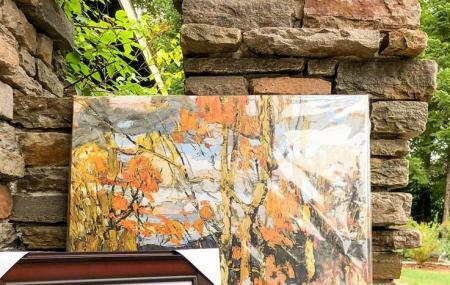 Among many other things to do, the Algonquin Park Art Centre is home to one of the most beautiful art galleries in Ontario. There’s also a tasteful souvenir shop where you can pick up nice souvenir gifts. When driving through Algonquin Park on Hwy 60, a stop at the beautiful Algonquin Art Centre is a must. This is a beautiful centre displaying fine Canadian artwork inspired by the landscape, flora and fauna of the wilderness. Artwork can be purchased, as well as (mostly) Canadian-made gifts in the tasteful gift shop. I have visited the centre on a number of occasions, but the grounds are particularly gorgeous in the fall when the leaves are turning. The new Tom Thompson walk outside the centre is lovely and informative. There is no admission cost to visit the art centre, but donations are appreciated. You can easily spend an hour here if you also enjoy the grounds, and it was well worth the $5 that I dropped in the donation box on my visit. I will be back, for certain. Love spending quality art time with kids and for myself. Beware that if you are not joining their instructed classes, you will have to pay for everything you need to use there, e.g. paint, brushes, canvas (on a wood paddle or a plank or anything else). But money wise it was affordable. The instructor would help you in achieving whatever you wanna draw. The art gallery offers great exposure for Canadian artists. The different exhibits are what brings people back. The new Tom Thomson walkway is exciting as well as informative. Great work by all. Thanks.